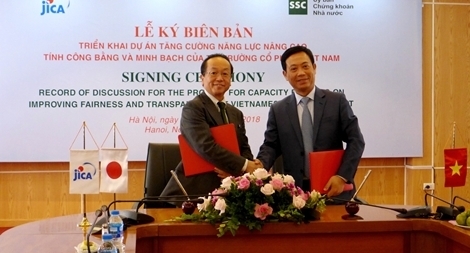 The Record of Discussions of the “Project for Capacity Building on Improving Fairness and Transparency of Vietnamese Equity Market” is signed on 5th November 2018 in Hanoi. Deputy Prime Minister Vu Duc Dam praised efforts made by scientists who are participating in projects in Vietnam and in the development of the country’s science and education sector while meeting 70 representatives in Hanoi on February 12. More than 24,000 people in Ca Mau province are expected to benefit from a community-based disaster risk reduction project in vulnerable areas in the Mekong Delta, heard a workshop on January 29. Prime Minister Nguyen Xuan Phuc worked with authorities of the Mekong Delta province of Bac Lieu in Ho Chi Minh City on January 12 to evaluate its socio-economic performance and discuss a number of major projects in the locality. PSNews – Lieutenant General Nguyen Van Son, Vice Minister of Public Security on January 11 worked with various police units on ensuring security and traffic order at Build–operate–transfer (BOT) stations. Thai Binh Province People's Committee has proposed a VND3.9trn (USD172m) public-private partnership coastal road project to the Ministry of Transport. Chairman of the Hanoi People’s Committee, Nguyen Duc Chung, has decided to halt a project of paving local streets with natural stones. Foreign direct investment (FDI) in Vietnam reached 33.09 billion USD in the first 11 months of this year, a year-on-year increase of 82.8 percent. PSNews - As of September, Da Nang attracted 408 domestic projects with total investment of VND 101,379 billion (about US 4.5 billion) and 525 foreign direct investment projects with total registered capital of US 3 billion. The transport ministry is in favour of the project to upgrade the Ha Noi Railway Station, as well as its surrounding areas, and to concretise the capital city’s general planning, said Deputy Minister Nguyen Ngoc Dong. The Ministry of Planning and Investment (MPI) has announced a list of 42 state-funded projects valued at VND43 trillion (USD1.9 billion) that have faced ineffective operations and losses. Vietnam’s north-central province of Thanh Hoa and Laos’ eastern province of Houaphanh are implementing a project using modern science and technology to grow mushrooms. The central province of Thua Thien-Hue is calling for investments in 104 projects during 2017-2018 with orientations towards 2020. Agriculture sector insiders put forth solutions to improve the entire rice value chain towards clean production, especially in the Mekong Delta, at a workshop in Ho Chi Minh City on March 3. Locally-owned TH Group, famous for its TH true MILK brand, has officially added to its hi-tech agricultural investment portfolio by a new US$136.4 million project in the northern province of Thai Binh. The Orient Commercial Joint Stock Bank (OCB) has partnered with local Fintek Company and the Malaysia-headquartered Tess International Company in an anti-money laundering project under an agreement signed on November 9.